The noise caused by the waves can injure and impair many different species of fish and marine wildlife. East Asia and the Northwestern Pacific are home to some of the world’s biggest and most productive fisheries, with average yearly yields in the 20-24 million ton range (Ahlenius 2004). The region is home to many coral reefs and these fisheries provide food for a large percentage of the world’s population. 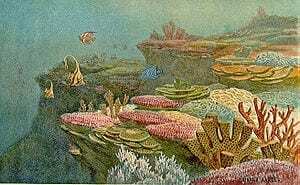 The coral reefs are also some of the most important ecological sites in the world, home to thousands of marine species. These biologically diverse marine habitats these reefs continue to add ecological and economical value to the waters off of Eastern Asia through tourism, recreation, and extractable resources. Offshore energy exploration allows nations to access additional fuel reserves and expand domestic industry, but there are many costs to consider. While large tracts of natural gas and oil occur in the seabed off the coast of East Asia in the Pacific Ocean they vary in degrees of difficulty and the resources needed to locate and extract these fuels. The process can be very lucrative and offshore drilling rigs are a common sight for many residents of coastal areas across the globe, but the hunt for these resources can be highly detrimental to the local ecosystems and other natural economic assets such as fisheries and tourist attractions. Types of offshore energy extraction include drilling for oil and hydraulic fracking, both of which have large impacts on the environment in which they are done. For example, seismic mapping, the initial assessment and surveying for potential oil deposits, consists of blasting high decibel waves along the seafloor to map deposits and their sizes (CAOE 2010). The noise caused by the waves can injure and impair many different species of fish and marine wildlife. These disruptions, especially in a highly productive environment, could potentially damage populations to the point of impacting fisherman’s daily catches, bringing down local economies and making it more difficult for fishermen to provide for their families. In addition, drilling also releases many toxic chemicals into the area, similar to the acidic heavy metal runoff created when mining on land. When used in close proximity to valuable ecological assets this concentration of chemicals can harm the reproductive cycles of fish and further exacerbate issues such as ocean acidification, a major factor in the decline in coral reefs (Boesch & Rabalais 2003). Perhaps the greatest and most publicized impacts of offshore energy exploration are oil spills. Highly detrimental to the environment, a large-scale oil spill like the Exxon Valdez or Deepwater Horizon in the Gulf of Mexico can cause adverse effects decades into the future. While extensive risk assessment and planning are required before drilling commences, accidents resulting in spills still occur, often due to poor regulation, oversight, or maintenance (Boesch & Rabalais 2003). Another challenge that comes with oil spills is the clean up. In a region such as East Asia where many countries have access to the coast, a large-scale oil spill could create issues in determining the responsibility of clean up, and getting countries to act in conjunction to address a multinational problem. This would be further hindered by the large degree of territorial disputes among East Asian nations in terms of rightful ownership of areas with oil and natural gas reserves. Many lay claim to the ownership and rights to harvest these resources, but would each country defend their responsibility for a spill, or would a blame-game erupt and further destabilize the region?